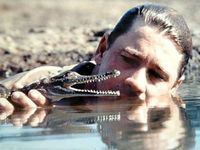 Steve Irwin, an image posted by Bindi Irwin on the 10-year anniversary of this death on Sunday. 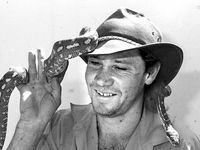 Bindi Irwin has paid tribute to her "hero" father. 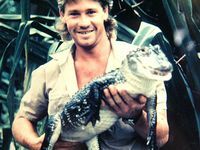 The 'Dancing With The Stars' winner reached the milestone age on Sunday penned an emotional message to 'Crocodile Hunter' star Steve Irwin on the tenth anniversary of his death. She wrote: "You'll be my hero for my entire existence. I love you more than words can describe." 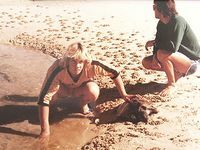 The anniversary of Steve's passing after being stung in the chest by a stingray barb was also marked by his wife Terri, who referenced the fact September 4 is also Father's Day in his native Australia. 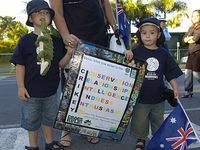 She shared a picture of Steve, Bindi, now 18, and their son Robert, now 12, and wrote: "Happy Father's Day Australia. Hug your dad." Bindi previously paid tribute to her dad when she turned 18 in July. She wrote on Instagram alongside a baby picture of herself with her parents: "Hello lovelies. Well today marks 18 years of life for me, here in Australia and I really don't know where to begin in thanking so many people for an unforgettable journey so far. So I think that I'll start here, with this photograph. "This photo was taken within the first year of my life. To be perfectly honest life has changed in a million ways since this photograph was taken. Along the way we gained another incredible part of our family, my brother Robert. 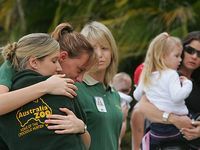 "Our conservation work with Wildlife Warriors took off around the world. 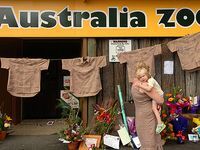 Our home, Australia Zoo continued to expand and has become the greatest zoological facility on planet earth. 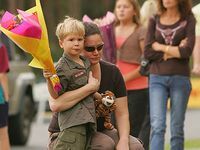 (sic)"
Bindi, although only eight at the time, spoke at her father's funeral, and 10 years later she wrote of what a "superhero" he was to their family. She continued: "Our Dad, Mum's soulmate and a superhero for us all, passed away. However, since this photo was taken, 18 years ago, one life ingredient has remained, unchanged, unbreakable. That is the unconditional love that is shared between my beautiful little family and the loyalty we have to each other and everyone else who has taken this journey with us. "I don't think that when this photo was taken even my beautiful parents could have known what life would evolve. I know that I am endlessly grateful for the love and light I have been given since Day 1 of my life. (sic)"